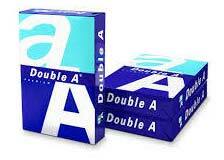 With dexterous crew of professionals, we are able to provide a qualitative spectrum of Double A4 Copy Paper (70 GSM). This paper is manufactured at our sound manufacturing unit using the superior quality basic materials and progressive techniques. The provided paper is widely used at offices, schools and shops for copying and printing applications. Also, our reputed customers can easily get this Double A4 Copy Paper (70 GSM) from us at market leading rates.